It's my day to post over on the Trendy Twine Blog today, and I am featuring Totally Pumpkin Trendy Twine and the 2x2x2 Kraft Boxes. They come 10 to a pack. They are easy to assemble, and perfect for so many uses. How cute would these be as 3 dimensional place cards? You could put candy in them, or a small gift. I am going to use mine as a gift box. 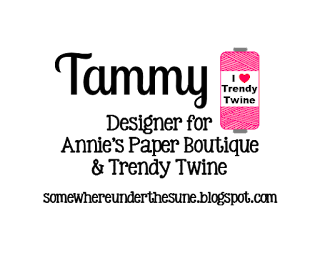 I trimmed the front of the box with Totally Pumpkin Trendy Twine trying off in a double bow. I decorated the front with a cute stamped Turkey image. I added some patterned paper lined with a complimentary scallop square to the top. I stamped Thankful for you in the center. I added Natural Jute Ribbon to the back and sides of the box. I took Totally Pumpkin Trendy Twine and embellished the jute ribbon adding a few buttons laced with more Totally Pumpkin Trendy Twine. So gorgeous! LOVING that turkey!!!!!!!!!!!!! I love how beautifully you decorated your box. Super cute turkey! Such a beautiful way to decorate that box for fall! Great job! Super cute Tammy! What a sweet turkey~great fall project! What a cute little box. Love it. Super cute treat box! Love the awesome design you created, the burlap accents look fabulous! That turkey is adorable! Omgosh! What uhhhhdorable little boxes! Tammy, this is so pretty! Love how you used the twine! This is a very pretty box!